SKU: PD-SUN-1. Categories: Pendants, Sacred Totems. Strength, energy and life. The Sun Wheel is an important Celtic symbol with many meanings. 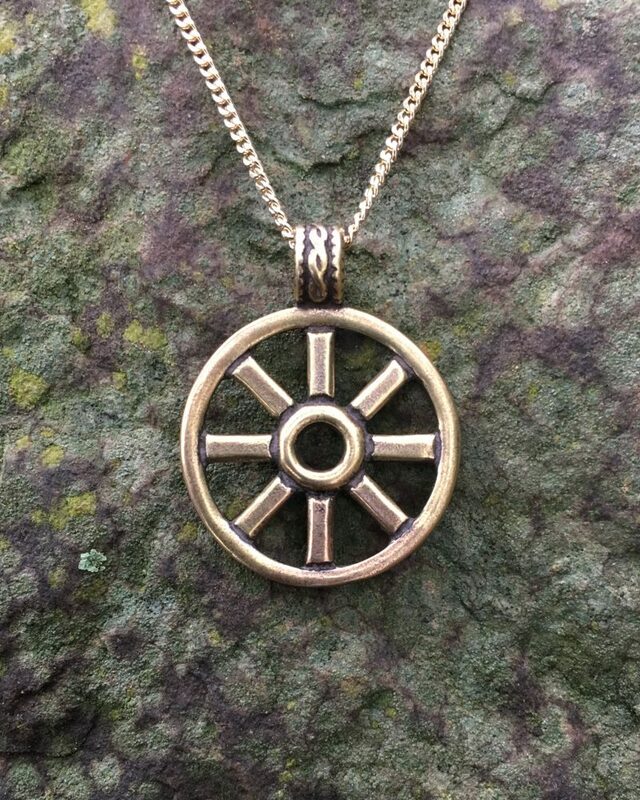 Tap into the power of the Ancient Celts with our Sun Wheel Pendant. This pendant is 1” wide by 1 ⅜” tall (25 x 35 mm), and comes with an 18” gold or silver-tone steel chain. Available in bronze and sterling silver. The sun has long been viewed as a source of mystic and cosmic power by many, if not all, ancient cultures, and was believed to be a source of strength, energy and even life itself. A simple circle is perhaps the very oldest symbols of the sun, and circles containing crosses were used to symbolize the sun as far back as the Stone Age, continuing throughout the Bronze Age, and well into the Iron Age. In the Iron Age culture of the Celts, the Sun Wheel was an important symbol and was frequently represented in their art. Bronze wheels were frequently worn as pendants and other decorations. Votive wheels were left at shrines, and cast into rivers, as offerings to the gods. Unlike the earlier simple circle and cross amulets of the Bronze Age, Celtic Sun Wheels were typically made with six or eight spokes, and were often made to resemble chariot wheels. The Celts may have gotten this idea from the Greeks, whose god Apollo was believed to carry the sun across the sky each day in his chariot. Or, perhaps, it was the Greeks that got this idea from the Celts – the Celtic sky god Taranis was always depicted with a lightning bolt in his right hand, and a sun wheel in his left. In the modern tradition of neo-paganism, a wheel with eight spokes is known as the Wheel of the Year, with each spoke representing one the eight pagan holidays – Midwinter (Yule), Imbolc, Vernal Equinox (Ostara), Beltaine, Midsummer (Litha), Lughnasabh, Autumnal Equinox (Mabon), and Samhain.